Journey To Everest – What’s It Worth? For the past year or so, we have followed his preparation as he attempts to summit Mount Everest in the spring. I had one recurring thought in my head the first time I sat down and chatted with Jim and it is still something that I have a hard time pondering — even though he gave me the answer… Is it worth it? After all, he is spending nearly two years of his precious time on Earth working his body to the max to climb 29,000 feet and stand on top of a mountain — that very few people have had the opportunity to, mind you — for at most fifteen minutes. So let me ask again, is it worth it? “How could the return investment be that big to make those five minutes worth it,” Jim responded. “That’s really the payoff, because the five, 10 or 15 minutes up top can’t possibly pay you back in a direct way.” That’s why it’s called the Journey to Everest. 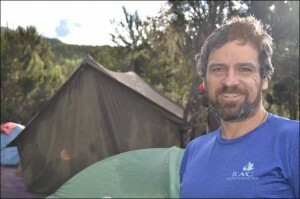 Jim Davidson is a longtime RAC member and active high-altitude climber as well as a public speaker. Read more about Jim and his adventures on his website: Speaking Of Adventure.